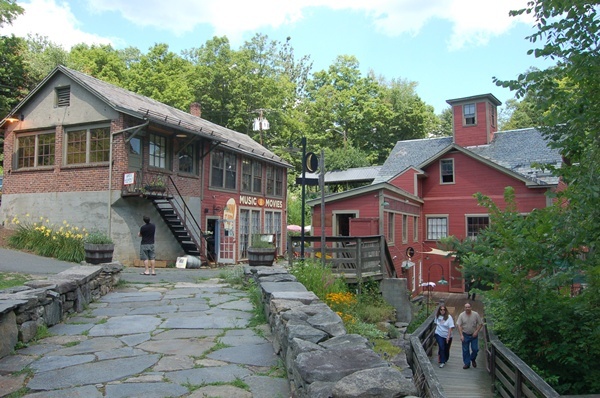 A visit to The Montague Book Mill in the western Massachusetts town of the same name has been on my New England to-do list for a decade. 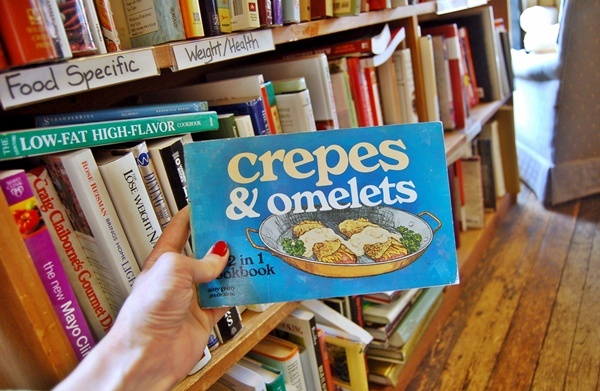 Their slogan — books you don’t need in a place you can’t find — really sums it up. 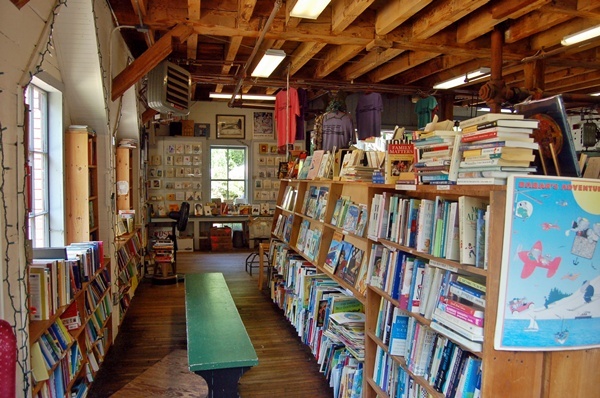 Books for fun in the middle of nowhere with beautiful New England scenery all around you? Plus food? Sold! 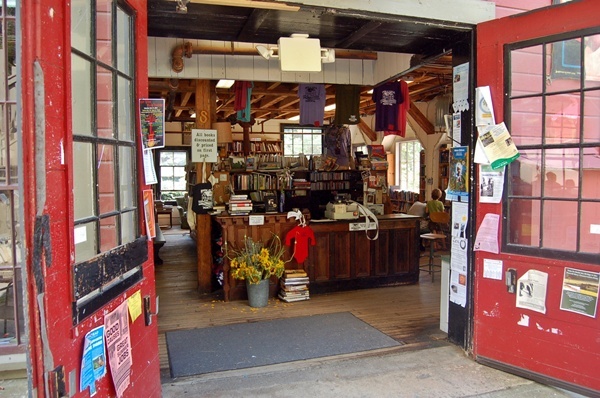 The lower entrance is instantly welcoming, with fliers, flowers, and t-shirts on display next to the shelves of books. As you’d expect, the kids section is colorful and crammed with eye-level storybooks for little hands. 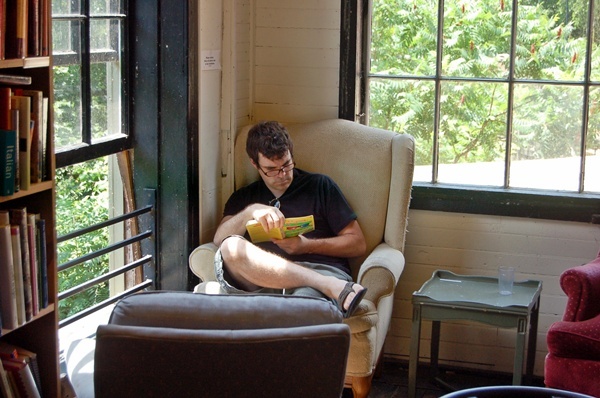 Mismatched chairs are everywhere, most with scenic river views, and visitors are encouraged to settle in and thumb through a book or two. 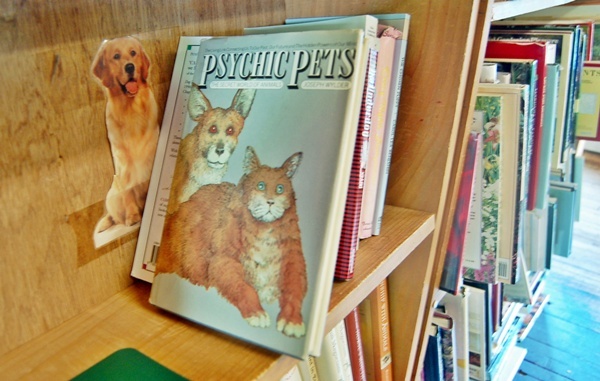 Or a terrifying cover for a book about psychic pets? Seems to me that cat should be more concerned with losing a few pounds. A short walk up a steep flight of stairs, then a quick right, puts you in this cozy room. I loved it… The tall, crammed bookshelves. The warm, honey tone of the floorboards. The scattered wingback chairs. 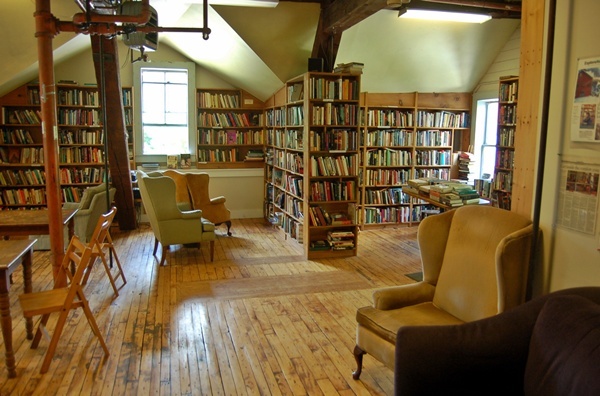 A secondhand reader’s paradise. If you exit the Book Mill on the second floor and walk across the elevated covered walkway and down the stairs, you’ll find yourself standing in front of The Lady Killigrew Cafe — the perfect place for lunch with one of your new books. 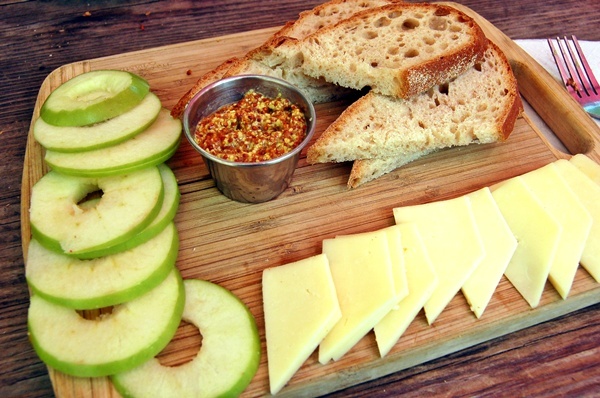 You can choose from a grilled sandwich, noodle or rice salad, or my pick…a bread board with green apple, cheddar, and stoneground mustard. Seating is indoors, or outside under an umbrella or with river views. 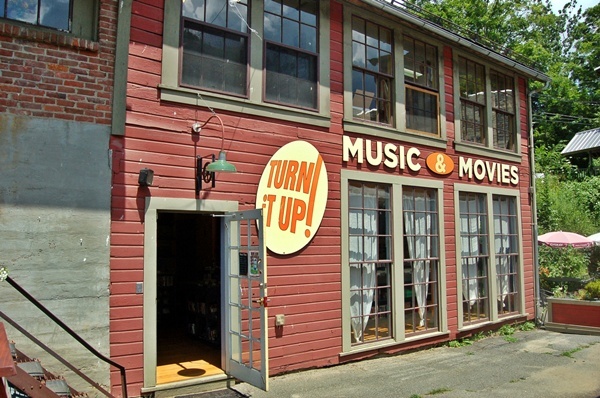 After lunch you can check out a branch of Turn it Up! 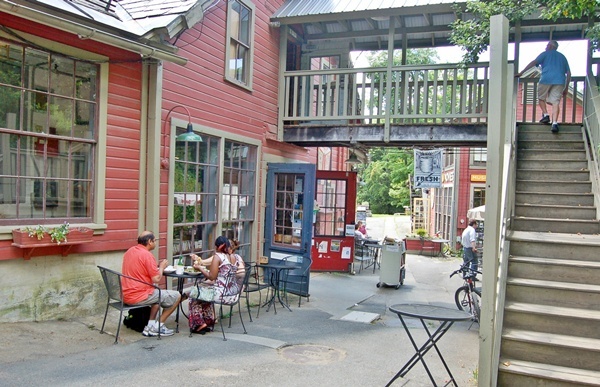 for music and movies, or head upstairs to the Sawmill River Arts gallery featuring fine arts, pottery, jewelry, woodwork, and handicrafts. In addition to The Lady Killegrew, you can also grab a more polished bite after hours at the lower-level Night Kitchen, where there is often live music while you eat. 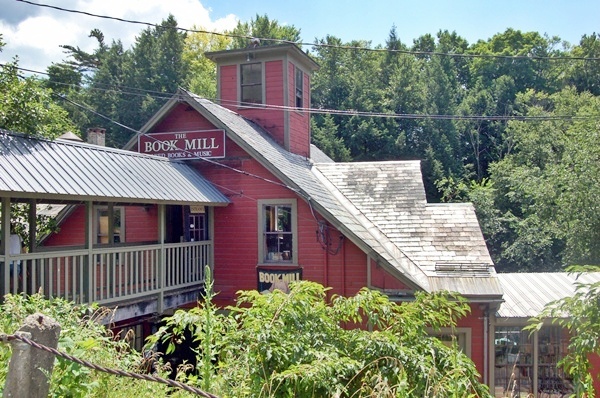 This was the first of what I know will be many visits to the Montague Book Mill. Have you ever been? My band played here recently, and I think we were all overwhelmed by how amazing this place is! I was really happy with my meal at The Lady Killegrew, and I loved sitting outside and watching the waterfall. I hope I have a chance to go back sometime soon! Rachel, between the Book Mill and Harlow’s it sounds like we like the same venues! Let me know if you have another show at either! Definitely! I’m not sure about my band, but Joel’s band (http://www.somervillesymphonyorkestar.com/) will be back at Harlow’s in September, and I’ll likely be along for the ride! I love that place. I’ve def never been. Looks super cute! 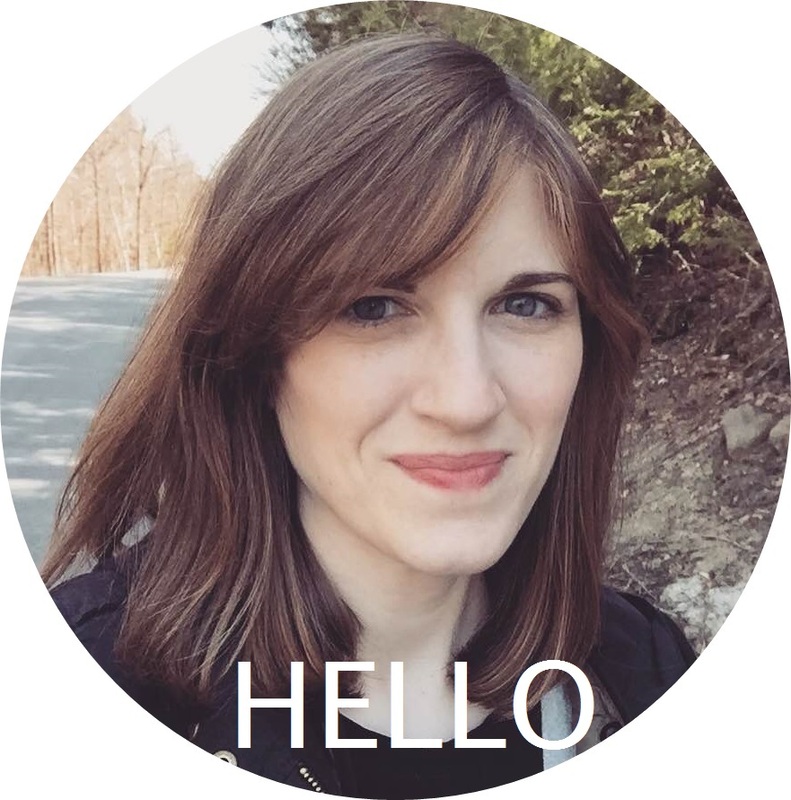 Aimee, I’m headed there this weekend — thanks for scoping out this wonderful place.